Employees are the real asset of any company. And hiring the right staff at the required time is one of the key ingredients to the success of a business. But it is not as easy as it sounds. This is where the human resource department comes in. They are the ones who are constantly studying the needs of the company and the number of people who will be necessary to carry out the work. This planning is very crucial for the progress of the company. The human resource department studies the need for people in every department. Based on this study, they sit together with the senior management to get approval and hire additional employees. 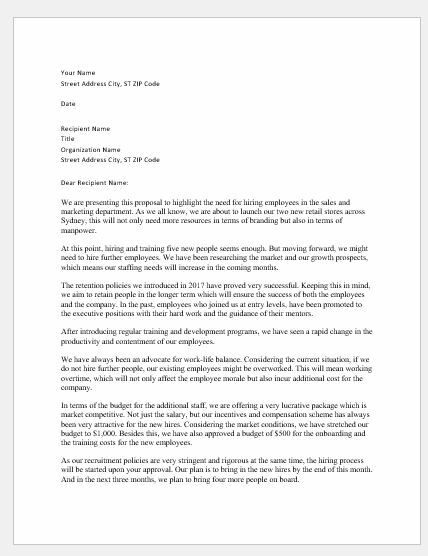 We are presenting this proposal to highlight the need for hiring employees in the sales and marketing department. As we all know, we are about to launch our two new retail stores across Sydney, this will not only need more resources in terms of branding but also in terms of manpower. At this point, hiring and training five new people seems enough. But moving forward, we might need to hire further employees. We have been researching the market and our growth prospects, which means our staffing needs will increase in the coming months. The retention policies we introduced in 2017 have proved very successful. Keeping this in mind, we aim to retain people in the longer term which will ensure the success of both the employees and the company. In the past, employees who joined us at entry levels, have been promoted to the executive positions with their hard work and the guidance of their mentors. After introducing regular training and development programs, we have seen a rapid change in the productivity and contentment of our employees. We have always been an advocate for work-life balance. Considering the current situation, if we do not hire further people, our existing employees might be overworked. This will mean working overtime, which will not only affect the employee morale but also incur additional cost for the company. In terms of the budget for the additional staff, we are offering a very lucrative package which is market competitive. Not just the salary, but our incentives and compensation scheme has always been very attractive for the new hires. Considering the market conditions, we have stretched our budget to $1,000. Besides this, we have also approved a budget of $500 for the onboarding and the training costs for the new employees. As our recruitment policies are very stringent and rigorous at the same time, the hiring process will be started upon your approval. Our plan is to bring in the new hires by the end of this month. And in the next three months, we plan to bring four more people on board. Please share your thoughts regarding this.